Sharpening gadgets that promise instant foolproof results continue to capture our imagination and our pocketbook, and the Toledo, Ohio-made Edgemaker is no exception - over 3 million have been sold. I have used one with mixed results, but rather than offer my opinion yet again here is a detailed evaluation done by an experienced sharpener and his novice brother, shared with me by e-mail and reproduced with their permission. This is long; you may want to skip to the summary. As you know I've been using the Edgemaker exclusively on my kitchen knives, with the intent of making a long-term study of their performance over time. Well, I've already got a couple of things to report. Firstly, the Edgemaker doesn't really do much at the tip of the knife … the last couple of millimeters don't seem to be touched at all by the slot sticks. Secondly, and more significantly, the Edgemaker doesn't deal well with nicks. My 8" chef's knife got a couple of nicks in the belly of the blade (I blame Carolyn, of course – she does the washing up). I could feel them distinctly when I next steeled the blade. I could see the corresponding glints quite clearly. I got out the aggressive Blue tool and started swiping, and swiping, and swiping, …, but never really noticed any progress. Yesterday I spent a good 30 minutes on the Blue tool and *thought* that *maybe* I was removing some metal and getting behind the nicks. Oh, I longed to get out my EdgePro Apex! (I still do, actually.) But I'm sticking to my project … at least for the rest of this week <g> … and I'm going to use only the Edgemaker to care for my knives. So, it's not a perfect system (and who ever thought it was? ), but for the price and the average man/woman in the kitchen I still think it's nearly the best bang for the buck. After the initial, complete sharpening of all my kitchen knives I've been religiously steeling (with the Yellow Tool) before/after/during any session in the kitchen, usually giving the blade about 6-8 very gentle passes through the tool. So, after a month or so I'm noticing that the blades don't seem to hold their edge very well. I can bring them easily to paper-slicing sharpness in only a few moments, but in about two days they don't seem as sharp and some cutting/chopping tasks are noticeably more difficult. I just took a look at my main chef's knife just now (after preparing dinner) and it's decidedly not sharp: there are plenty of glints randomly distributed along the length of the blade. This is a little surprising since the Edgemaker puts a 45-degree edge angle on the blade which should be fairly durable. I used to sharpen them on the Edge Pro Apex with a 30-degree relief and a 40-degree primary and (with regular honing) they would last quite a long time. Perhaps it's the lack of relief that's the culprit? At this point it's a mystery to me. Why should a 45-degree edge go dull in a couple of days? I only use the chef's knife to cut some fruit in the morning and to prepare dinner at night – I'm not abusing it by any means (on a wooden cutting board). Even so, by working through the set of four tools – using very gentle or no pressure, but plenty of swipes – I can restore the original performance quite handily. However, I seem to be spending a lot more time sharpening/tending/mending my knives than I am accustomed to. Overall, I still think the system works – and may be optimal for the amateur on a tight budget – but it doesn't rival a “real" sharpening. But the evaluation goes on! I probably ought to start charting the time I spend restoring bum edges … but I don't have corresponding data from the Edge Pro for comparison. Maybe I'll track that time after I conclude this long-term test. I'll keep you posted: watch this space. Yes, I'm still slugging it out with the Edgemaker in my kitchen. I've reported that it doesn't do much for the tips of knives (and I don't really see how it could, given its design). I've also noted that the edges don't seem to last. I spent some time sharpening my principal chef's knife on Monday, working through all four sets of slots … and then on Tuesday was unable to cut a lime in half! I couldn't get any “purchase" on the skin with any portion of the blade – even with considerable pressure! I pulled another knife from the block (also sharpened on the Edgemaker, but seldom used) and it sliced through the lime with ease. I was flabbergasted (and frustrated … a feeling I'm becoming familiar with). 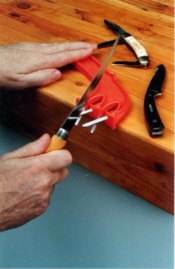 Prior to this occurrence, I had experimented with “sawing" on the Edgemaker slot gadget, i.e. sliding the blade back and forth through the rods. My reasoning was that it's a constant, 45-degree angle, it's sharpening both sides at once, there isn't any burr to speak of … why shouldn't it work equally well in both directions? It seems that I was wrong, and the experiment was a bust. I went back to the beginning and restored the chef's knife edge using only uni-directional swipes and it was back to “normal" once again (although the current “normal" is not quite what the former “normal" used to be). My brother also reports that their knives don't seem to hold their edges … although he attributed this to a new found appreciation for sharp knives: “It could be that I expect them now to be sharp and since things don't stay that way, I notice it more." I'm not as generous: they just don't hold their edge, and I don't really understand why. I've become accustomed to spending 5-10 minutes every couple of days restoring the edge on my primary knife. I don't think the Yellow honing tool does much of anything. I am going to tough this out, but it isn't as much fun as I'd hoped it would be. I'm deep in the valley of frustration that comes with relying on a slot gadget for my everyday edges. As I've said, the Edgemaker puts on a nice, sharp edge relatively quickly. As I've also said, that edge will last only a couple of day … with only moderate use in normal (or better than normal) situations. My primary knife requires nearly constant attention. At this stage I've stopped using the Yellow honing tool and keep instead the Orange "Edgemaker" tool on my counter-top. Instead of honing (which as far as I can tell has no redeeming merit with this system), I re-sharpen daily – just 10-12 very light strokes through both sets of slots (medium-coarse, and medium-fine). It takes about the same time has pure honing, but actually does a little more to maintain the edges since the cross-sticks are a little more aggressive. The Edgemaker isn't junk … it does work … but it requires a LOT more attention than a more traditional sharpener (i.e. the EdgePro Apex). I'm beginning to wonder if some side-to-side wobble while pulling the blade through the slot is the culprit. I'm scrupulously careful to line up the back of the knife with the target "sight," but nobody's perfect and I'm sure I've introduced some "wobble" into the very edge … that might be why it dulls so quickly: only about 60-80% of the blade is truly aligned, and some chopping tends to un-align the remainder – or at least the heavily used portion of the edge. I still haven't had a gander at the blade under the microscope. I should move that to the top of my priority list. My advice at this point? Don't rely on a slot gadget for your only/everyday sharpening needs. Maybe it's time for me to "invent" my own slot gadget: one tool to set the relief (say 30 degrees inclusive) and the rest to set the primary bevel (40 degrees). Those are the Spyderco Sharpmaker's angles, and when I experimented with using it exclusively I had (as I recall) much better results. If I hadn't promised myself that I'd stick with this thing for months (I think I said years … but that's not going to happen) I'd already have put it on the closet shelf. I'm going to tough it out longer, until I simply can't stand it any more. The next step will be to put the Orange tool in the drawer and just use the Blue tool on a daily basis. I miss my old sharpness! I almost cried as my newly "sharpened" chef's knife bruised a handful of Italian parsley – it was just incapable of cutting through a paper-thin leaf. It turned the parsley into a blackened, ugly mess. I was fed up – I'd spent several minutes today working on the edge for tonight's dinner prep. So I dug out the Blue tool and had my way with it – using brutal amounts of force to try to coerce metal off the edge. There were glints everywhere before I started (and this was *after* I spent time with it earlier today). I'd give the blade a dozen or so swipes and then look for glints. I kept lightening the pressure applied as I went along. Then I moved to the Orange tool and kept on swiping, checking for glint, and lightening up the pressure. And then I realized the fatal flaw of the Edgemaker! My "wobble" theory (lateral movement of the knife while drawing through the slot) wasn't it (at least, not entirely). The problem is the slot itself! Any slot gadget cannot raise a burr: it's working on both sides of the edge at once. What happens is that the fine "wire edge" develops directly on the cutting edge itself. It's impossible to deburr in the very same slot that's sharpening. So you end up with an astonishingly sharp edge that dulls the very instant that you use it. The wire edge right along the cutting edge simply bends over the very instant that it contacts the cutting board, here, there, and (ultimately) everywhere. It has nothing to do with relief or edge angles, or anything else. I'm reasonably (80% plus) sure that this is the main failure of the slot gadget. No amount of honing (however gentle) is going to remove that wire edge standing straight up from the blade. So tonight I tried another tactic based on this idea: I pulled the blade through the slot, but always in contact with one rod or the other. The angle is the same (45-degrees), but now I'm sharpening (mostly) only one side at a time: hold the blade against the left rod, sharpen the right bevel at 45-degrees, and vice versa. There was a significant amount of "chatter" from the blade as it was subjected to this new treatment, but as I drew my thumb across the cutting edge I could tell that I had a *much* better edge in progress. So (at least for now), it's more like conventional sharpening: work on one side of the blade at a time (say, 10 strokes) then hold the knife against the other rod for another 10 strokes. Of course this is all theoretical at this point. It's all subject to change as my results direct me, but this seems promising – at least until dinner time. My latest Edgemaker approach (which seems to be *almost* working) is to run the knives through all four sets of slots each and every time ... 15 swipes in each slot. I also run the blades off-the-edge on my ceramic "steel" after the Yellow tool at about a 45 degree angle or more (or less depending on the current state of my theory). Starting with the aggressive Blue tool I use moderate pressure and lighten it up gradually as I work through the slots. On the Yellow honing tool there is hardly any pressure at all. The edges still don't last, and they're not the best, but they're far better than anything delivered by any of my other theories. I'm still mystified by (A) why the original sharpening put on such a nice edge, (B) why it didn't last, and (C) why I could never get that original edge back ... except by recreating the experience and using all four sets of slots. I don't know if you ever posted my notes on your website or not, but this is the closer. Background: My brother's wife is a busy cook but she's hard on her knives, and he's no sharpener. He does what he can with a grooved steel but that's the extent of his "sharpening." I wanted to find something inexpensive and foolproof for him to use. After a bit of digging I discovered the Edgemaker, three plastic handles with four sets of slots in varying abrasive levels, from rough texture to smooth steel. I bought a set and ran an exploratory knife through the system. It came out remarkably sharp! I was slicing paper to ribbons. The next day I bit the bullet and ran my whole knife block through the slots … again, remarkably sharp – about as sharp as the edge I put on them with the Edge Pro Apex. I began lobbying my brother to buy a set for himself. He did and reported the same result: very sharp blades. His wife even cut herself several times. Present: I noticed that my own knives weren't holding their edge very long, just 2-3 days' use would dull them. My brother said the same thing. The Yellow Tool (smooth steel) didn't seem to condition the edge at all. Running a blade through the full set of slots, identical to the original sharpening, did not result in the same edge as that first time. It simply wasn't as sharp, and didn't stay sharp. At that point I began experimenting with various techniques, and I believe I tried every conceivable trick: I "sawed" the blades through the slots, I ran them through perpendicular to the slots, I held the blade against one peg and then the other … but nothing I tried either (A) restored that original sharpness or (B) made the edge last longer than just a couple of days. My brother experimented by using only the Blue Tool (coarsest) and had the same outcome as I did. I was practically at my wits' end: bruising parsley instead of chopping it, being unable to cut through a lemon, all of these failures were killing me. I wanted so to get out my Apex … or even my Spyderco Sharpmaker! But my premise remained the same: I need to keep my knives in kitchen fitness and I can't use anything that my brother doesn't have (he certainly doesn't have a TORMEK). That's when I began to use the grooved steel and the ceramic steel (a couple of years ago I gave my brother the exact same IKEA ceramic "steel" that I have), and he already had a grooved steel. I found that 15-20 swipes on one or the other steel put the edge back into cutting shape. When the steel no longer did the job, I'd pass the blade through the Edgemaker set with some very large number of swipes: 100-150 on Blue (coarse), 50-100 on Orange (medium and fine), and then 25 or so on Yellow (smooth) … and then finish with 15-20 passes (off the edge) on the steel. This became the norm, and it produced an edge that, while never as good as the initial Edgemaker sharpening, and never as good as a "real" sharpening, did seem to last more than 2-3 days, and was acceptably sharp enough for me to live with it … and that's what I've been doing since. I passed this information along to my brother and he said he was going to implement the same practice. I haven't had any feedback since to verify that his results match my own. So the mystery of the Edgemaker Slot Gadget is this: Why does it create such a fantastic edge on first use? Why doesn't that edge last? And why can't you ever recreate that original edge? I honestly can't answer any of these, and I've had dozens of theories that I've tried, tested, and decided were bunk. I still ponder this mystery every time I hone or sharpen my edges. But the bottom line is this: If you're willing to accept a "tolerable" sharpness (your tolerance levels may vary! ), and you want a foolproof system, and you don't want to spend more than $30-40, the Edgemaker and a good steel may see you through. You'll spend more time maintaining your knives than you probably should, they'll never be a good as they could/should be, but you can live with it as your only sharpener. I have, now, for several months … as has my brother. I only wish I could solve the mysteries! I spent a couple of hours yesterday and today trying to make my chef's knife sharp … it was chattering badly on the Edgemaker, even after hundreds of swipes through the Blue tool (after having rotated all the pins). A few days ago I switched to using my serrated (bread) knife for most dinner prep work (it was simply sharper). Well, today I caved in. I dug out my EdgePro Apex and sharpened it properly. It actually took a couple of *hours* to bring my knife back into condition again. Using the 120-grit stone I laid down a 30-degree (inclusive) relief, and then using each stone up to 600-grit I polished in a 42-degree primary edge. Nearly all of the time was spent grinding away the relief on both sides … the primary edge only took about 15 minutes total from start to finish. Carolyn had been out shopping and when she came home she spotted the knife on the kitchen table (where I had been working (dry!)). She exclaimed, "Whoa! That's a *SHARP* knife!! I can tell just by looking at it that it's killer sharp." She noticed the glint off the cutting edge. I pulled an old catalog out of the trash and sliced it to ribbons effortlessly (making circular cuts, S-shapes, and near anything I wanted to do). She involuntarily backed away. "Be careful tomorrow," she cautioned. So, I have broken my "promise" to use only tools my brother and I have in common to maintain my kitchen knives … but I toughed it out for quite a long time, several months if not a year entirely. At $200 a pop (for the kit I have), it's only 10X as expensive as the Edgemaker but to be fair it does a more than 10X better job at sharpening. The Edgemaker will do what it says it will, but for a knife with "issues" it's problematic to get it back into cutting condition. The EdgePro Apex will deal with any knife (including a former Edgemaker product) and bring it back into superb shape (with enough elbow grease). I'm already looking forward (with glee!) to tomorrow's dinner prep. I may have to re-arrange the week's menu to put "vegetable forward". As you know, I threw in the towel on the Edgemaker … but (so far) only for my 8" chef's knife. I have found, though, that the Yellow honing tool does a very good job of maintaining the edge on my blade. I put a 30-degree relief down, and then a 42-degree primary edge on my knife. The Edgemaker hone is set at 45-degrees and using it gives me a very sturdy triple-bevel that holds up very well. Another consideration is the ease of use and invariable angle control while honing: I keep the Yellow tool in the drawer and it's a matter of a few seconds' work to re-align the edge. So I haven't completely scrapped the Edgemaker and I'm quite happy with the honing tool. Find your Yellow Edgemaker and give it a try! I think you'll be pleasantly surprised at how well it works.